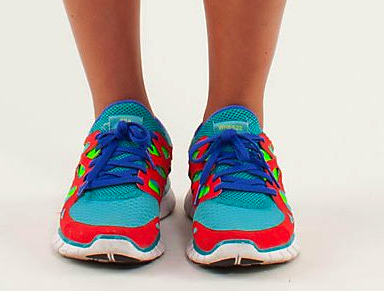 An eagle eyed reader noticed on the picture on the lululemon website for the Run: Speed Squad Skirt that the model is wearing Nike Frees in Sea Wheeze colors! 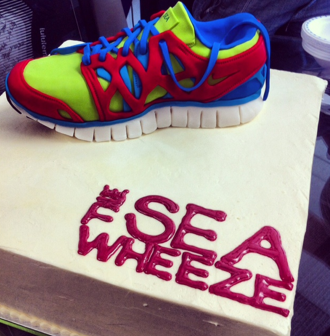 There is also a twitter picture of a cake lululemon had made to celebrate the Sea Wheeze training completion. I wonder if these Specialty Nike Frees where customized just for photo shoots or if they will be for sale at the Sea Wheeze store for all participants. New Brushed Power Luxtreme Tights!! "The Latest: No Limit Tanks in Power Purple and ZIggy Wee Greys, Power Purple and Currant Swiftly Tech 1/2 Zips, Power Purple Scuba and CRB, Run Make a Break Jacket and More"
"Clean Green for Ivivva. Is it Making a Comeback? And Triple Flip Find"